From figurines to cups and saucers, porcelain of the Victorian era is lovely and timeless. Whether you're looking for something specific to add to your collection or you're just interested in a few pretty pieces, there are plenty of great sources for buying Victorian porcelain. 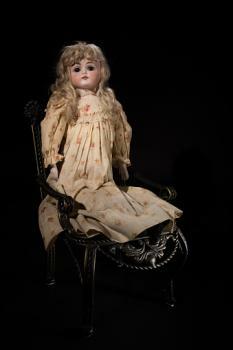 Several retailers specialize in antique porcelain figurines, dishes, and other collectible items. Depending on what you're looking for, one of the following retailers may be a good place to start your search. Specializing in dinnerware, tea sets, collector's plates, and other collectible items, Replacements, Ltd. is one of your best resources for those hard-to-find pieces. You'll find Dresden figurines, Limoges dishes, and much more. Even though Replacements, Ltd. specializes in rare pieces, they may not have your pattern or specific piece in stock all the time. In fact, many manufacturers and patterns are so rare that you may want to put your name on an alert list if any pieces come in. 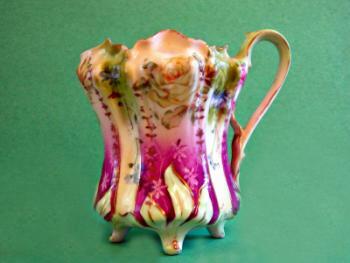 Ruby Lane is an online antique mall with a great selection of Victorian porcelain. You'll find dozens of items, including tea sets, picture frames, figurines, vases, collectible plates, and much more. The selection changes all the time, so if you don't find your pattern or piece right away, stop back from time to time. If you're looking for something especially rare and valuable, M.S. Rau Antiques has an amazing selection of 19th century porcelain. This is not the place to shop for a bargain, but no other shop has so many exceptional and breathtaking Victorian porcelain pieces. You'll see everything from Meissen to Sevres and much more. There are amazing decorative pieces, such as porcelain mirrors, clocks, and even porcelain furniture. You'll also find an enormous number of figurines and other desirable pieces. eBay is another good resource for finding Victorian porcelain. At any given time, you'll see hundreds of different examples of these gorgeous dishes and decorative objects. More common patterns and manufacturers are easy to find, often at a good price. You'll also encounter rarer pieces by manufacturers like Limoges and Meissen. Once again, the selection is constantly changing, so it's a good idea to set an alert for specific items you want to find. There are so many different types of pieces and manufacturers that it's always a good idea to learn a bit about these options before you start shopping. Keep the following information in mind as you build your collection. Gothic Revival - Extending from about 1830 to around 1880, the Gothic Revival movement featured symmetry, ornate filigree work, Gothic-style arches, and sweeping geometric shapes. You'll find these Gothic motifs on everything from porcelain dishes to frames and mirrors. Arts and Crafts - This movement began as a reaction to the machine-made items common after the industrial revolution. It focused instead on handmade pieces, natural motifs, and simple lines. You'll find Arts and Crafts porcelain items dating from about 1860 through about 1900 and is most noticeable in artist-made porcelain pieces, especially from Great Britain. Aesthetic - The Aesthetic movement extended from around 1850 through the mid-1880s and involved simpler motifs inspired by many non-Western cultures, including India, Japan, and China. In porcelain pieces from this movement, you'll notice Asian figures and botanicals with simple lines and uncomplicated shapes. Art Nouveau - The spectacular Art Nouveau movement got its start right at the end of the Victorian era, and you'll see these motifs on porcelain pieces dating from around 1890 onwards. Common design elements included sweeping lines, flowers, cattails and other botanicals, animals, female figures, and other nature-inspired decorations. Balleek - This Irish porcelain company made a range of styles during the Victorian era, but many pieces feature a basket weave design and shamrocks. Dresden - This German company focused on ornate figurines and floral motifs during the late 19th century. Imari - During the early part of the Victorian era, Imari Japanese porcelain was popular. It featured ornate, colorful designs. Limoges - Produced around the city of Limoges, France, this type of porcelain features beautiful floral designs. Meissen - This German porcelain company was popular long before the Victorian era, but their ornate Rococo-style figurines and objects experienced a resurgence in popularity during this period. Royal Doulton - This English company specialized in porcelain tableware and figurines during the Victorian era. R.S. Prussia - This exquisite German porcelain features portraits, floral designs, bright colors, and elaborate motifs. 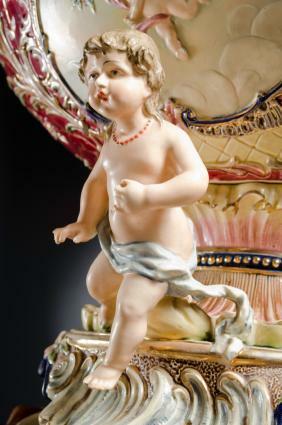 Sevres - Produced near Limoges, France, Sevres porcelain offered a range of lovely, high-end pieces. Victoria Austria - This Bohemian porcelain is quite collectible and often features bright florals and figures. If you're buying antique Victorian porcelain, it's important to know a bit about how to identify your piece and how to spot a fake or reproduction. The more you know about what you're buying, the less likely it will be that you'll lose money on your purchase. Your piece of porcelain should have a maker's mark on the bottom or the back side. In addition, porcelain sold in the United States after 1891 should have the country of origin stamped on the piece as well. Prior to that time, the country of origin may not appear. You can use the maker's mark to identify the manufacturer of your piece. Kovels.com has an excellent list of porcelain and pottery marks for most of the major manufacturers. Look up the backstamp on your piece to determine who made it and often, the year in which it was manufactured. Early marks were applied by hand during production, so they will be a bit imperfect. Expect the mark to be a little faded or smudged, particularly near the edge. The word "Victoria" or "Victorian" is a common feature on these fake stamps, so don't assume this makes the piece authentic. Instead, compare the stamp closely against the known marks for that manufacturer to make sure it is identical to one of those shown. Your piece should show some signs of wear, no matter how perfect its condition. Look for tiny dark cracks, called "crazing," as well as rough spots along the base of the plate or other piece. Whether you collect Victorian antiques or simply enjoy the beauty of these exquisite old pieces, antique porcelain from the 19th century is a treasure to admire and enjoy. Knowing where to find these items and how to make sure they are authentic is important for expanding your collection of these gorgeous historical art pieces.